With less than a week to go before Election Day, there are usually two or three clear indicators that one candidate has momentum and the other doesn't, some idea of how the remaining undecided voters are going to break. It was obvious in 2008. Such is not the case in 2012. First, there are no more undecideds. Zip. Nada. Yes, about 10% say they could still change their minds, but everyone planning to vote has a preferred candidate. So there's no large bloc to break in a single direction. And second, there is a consistent split between most national polls and state battleground polls. 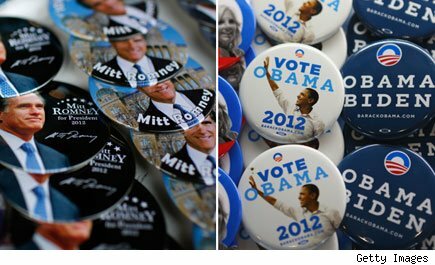 National polls show a Romney lead, some as high as five points, while state battleground polls show the race statistically tied, but with a persistent Obama lead, as we've seen in Ohio and Wisconsin. So where does that leave us? As two veterans of too many political wars, we know that while both campaigns are publicly expressing supreme confidence that they will win, both are wracked by a private paralyzing fear that they may in fact lose. What has made this frustrating uncertainly even worse is an October surprise no one saw coming -- Hurricane Sandy. So with the 2012 presidential election around the corner, here are the five things to watch for in the next week. 1. When it comes to Hurricane Sandy, he who attacks first loses. We have one message for both campaigns: Don't be the first to go on attack. Voters couldn't care less about politics when they see fellow Americans suffering. Each campaign will have to tread very carefully, and each candidate would be wise to adopt a more positive, uplifting tone until the lights come back on and people aren't swimming to their homes. Whichever campaign abandons this approach in favor of the traditional end-of-campaign negative will be punished at the polls. 2. Will the turnout be more like 2008 or 2004? If readers want to know why so many polls are all over the place, it's very simple. It's based on a "likely voter model" that differs from pollster to pollster. These likely voter models are all based on pollsters' own assumptions of what the electorate will look like in 2012, with age and ethnicity being particularly important factors. The fact is that polling is as much an art as it is a science -– and art can be very messy when it comes to likely voter models. It's assumed that young voters and voters of color will not reach the historic levels of 2008, but how far below that bar reality will be is an open question. Then there is the partisan split. In 2004, Republicans voted at a much higher percentage than Democrats, leading Bush to victory. In 2008, turnout hit record levels for Democrats, while Republican turnout was depressed. If the turnout is close to 2004, Romney wins. If it's similar to 2008, Obama wins. It's a simple equation -– but impossible to predict. 3. Don't believe the early vote hype. Both sides are already proclaiming that they are ahead in early voting. The Obama campaign is crowing about how they are meeting or beating Republicans in nearly every key battleground, while the Romney campaign is asserting how they are exceeding the McCain early vote results by huge margins. Don't believe the hype. As a general rule, Democrats are more likely to vote early, while Republicans tend to vote on Election Day. The more important question, is how many soft leaners and truly undecided voters will there be come Election Day? We think very few. These are the hardest voters to find, they are just as likely to stay home, and they will not be influenced by the campaigns' Get-Out-the-Vote programs. All that being said, if you want to look at a couple of important statistics in terms of early vote, look at these two factors: (1) what percentage of the state has voted early (and whether it exceeds 2008); and (2) how are Republicans performing relative to Democrats in key strongholds relative to 2008. As you look at the early vote totals, think about this; if Democrats are underperforming and Republicans over-performing (or vice versa), you'll have a better idea who may win that state and the election. 4. Is it a new battleground or a fakeout? Over the coming days, reports will leak out of states where one campaign is buying ad time or shifting resources because it just might be in play. In the last 48 hours, supporters of Romney have purchased ad time in Minnesota, Pennsylvania, and Michigan, leading some to believe the electoral map has expanded. Is it true? It all depends. In 2000, for example, though the Bush team professed that even California had become a battleground state, such was not the case. The reality is, in most cases, these are fakeouts by the campaigns to try and bleed the other side of resources and force the campaign to shift valuable candidate time to that state. After all, with just days left, the most important commodity the campaigns have is time. Shift Obama to Pennsylvania, and he's spending less time in Ohio. Force Romney to visit North Carolina, and he has less time for Virginia. The simple fact is if you see a Romney or Obama, or Biden or Ryan, visit a state they have seldom visited during this campaign, that state is now in play. So watch out for Pennsylvania, Michigan, and particularly Minnesota. If the candidate shows up, the campaign cash is sure to follow. At 8:30 a.m. Friday, the final pre-election jobs report was released and, frustratingly for both sides, it provided something for each campaign to tout. More than 170,000 new jobs were created in September, handily beating expectations, which is good news for President Obama. But the unemployment rate went up to 7.9%, which allows the Romney camp to declare that the unemployment rate is now higher than when President Obama took office. The question is which factor -- jobs created or an unemployment rate increase -- is more important for voters? It's not an easy question to answer. The fact is that each campaign will grab this conflicted jobs report to confirm their narratives -- for Romney, it's the economy isn't recovering, and for Obama it's that the economy is recovering. For now, the only thing to do is watch and see if one campaign's narrative starts winning over the other and the national tracking polls start breaking in one direction or another, providing one candidate with a bit of momentum going into Election Day. So that's where we are with less than a week to go -- a race that in the truest sense of the word is a genuine toss-up. If you want to know exactly what to watch for on Nov. 6, be sure to read our final piece posted on Election Day morning for a minute-by-minute breakdown of what to look for as polls close across the country. Then be prepared: It's going to be a very, very long night. Chris Kofinis is a Democratic strategist. Frank Luntz is a Republican pollster and strategist. AOL has an elections content partnership with Chris Kofinis and Luntz Global.